The hot dip galvanizing process is relatively simple. It involves cleaning steel and immersing it in molten zinc to obtain a coating. 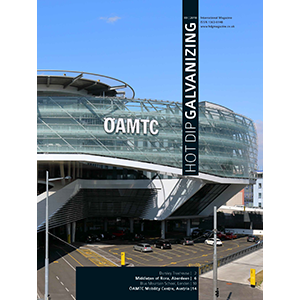 Hot dip galvanizing is the process of coating iron or steel with a layer of zinc by immersing the metal in a bath of molten zinc at a temperature of around 842 °F (450 °C). 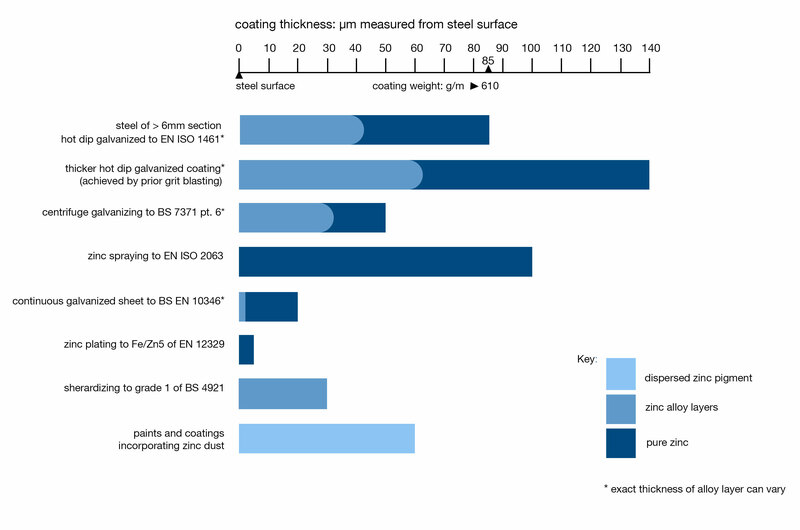 During the process, a metallurgically bonded coating is formed which protects the steel from harsh environments, whether they be external or internal. Galvanized steel is widely used in applications where corrosion resistance is needed without the cost of stainless steel and can be identified by the crystallised pattern on the surface (often called a ‘spangle’). Galvanizing is probably the most environmentally friendly process available to prevent corrosion. 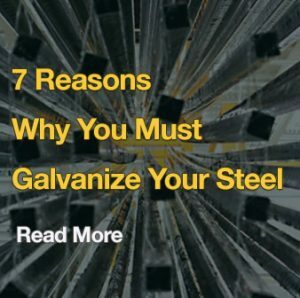 The galvanizing reaction will only occur on a chemically clean surface. In common with most zinc coating processes, the secret to achieving a good quality coating lies in the preparation of the surface. It is essential that this is free of grease, dirt and scale before galvanizing. These types of contamination are removed by a variety of processes and common practice is to degrease first using an alkaline or acidic solution into which the component is dipped. The article is then rinsed in cold water to avoid contaminating the rest of the process. The article is then dipped in hydrochloric acid at ambient temperature to remove rust and mill scale. Welding slag, paint and heavy grease will not be removed by these cleaning steps and should be removed by the fabricator before the work is sent to the galvanizer. After further rinsing, the components will then commonly undergo a fluxing procedure. This is normally applied by dipping in a flux solution – usually about 30% zinc ammonium chloride at around 65-80°C. Alternatively, some galvanizing plants may operate using a flux blanket on top of the galvanizing bath. The fluxing operation removes the last traces of oxide from the surface and allows the molten zinc to wet the steel. When the clean iron or steel component is dipped into the molten zinc (which is commonly at around 450°C) a series of zinc-iron alloy layers are formed by a metallurgical reaction between the iron and zinc. The rate of reaction between the steel and the zinc is normally parabolic with time and so the initial rate of reaction is very rapid and considerable agitation can be seen in the zinc bath. The main thickness of coating is formed during this period. Subsequently, the reaction slows down and the coating thickness is not increased significantly even if the article is in the bath for a longer period of time. A typical time of immersion is about four or five minutes but it can be longer for heavy articles that have high thermal inertia or where the zinc is required to penetrate internal spaces. Upon withdrawal from the galvanizing bath, a layer of molten zinc will be taken out on top of the alloy layer. Often this cools to exhibit the bright shiny appearance associated with galvanized products. Post galvanizing treatment can include quenching into water or air cooling. Conditions in the galvanizing plant such as temperature, humidity and air quality do not affect the quality of the galvanized coating. By contrast, these are critically important for good quality painting. No post treatment of galvanized articles is necessary and a paint or a powder coating may be applied for enhanced aesthetics or for additional protection where the environment is extremely aggressive. Chemical conversion coatings and other barrier systems may be applied to minimise the occurrence of wet storage stain. How long does hot dip galvanizing take? Provided reasonable notice is given, most articles can be hot dip galvanized and returned to the fabricator within a week. A typical turnaround, depending on size of the order, is three days. Galvanized bolts and nuts are now widely stocked but it is advisable that orders for galvanized fasteners should be placed as early as possible. The hot dip galvanising process is very versatile and articles ranging in size from nuts and bolts to long structural sections can be treated. This range, together with the ability to bolt or weld fabrications after galvanizing, allows almost any size of structure to be galvanized. Complex shapes, open vessels and most hollow articles can be galvanized, inside and out, in one operation. Certain hollow fabrications may be galvanized on the outside surface only, however, this requires special designs and galvanizing techniques. The capacity of individual galvanizing plants is detailed in the ‘Find a galvanizer‘ section of our website.